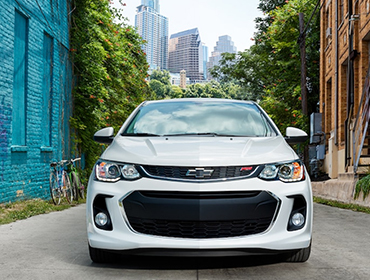 Offering up to 37 MPG highway, the available 1.4L turbocharged engine and available 6-speed manual transmission help you squeeze all the fun you can get out of every mile, also pushing 138 horsepower. The 2018 Sonic compact car makes an impression that’s anything but small. With remarkable technology and fuel efficiency, along with tons of personalization possibilities, the fun you have and the statement you make will be equally unforgettable. Rear 60/40 split-folding seats help this compact car accommodate almost whatever you’re hauling. For serious gear, Sonic Hatchback shows off a surprising 47.7 cu. ft. of cargo space with the rear seats folded down. And, with 14.9 cu. 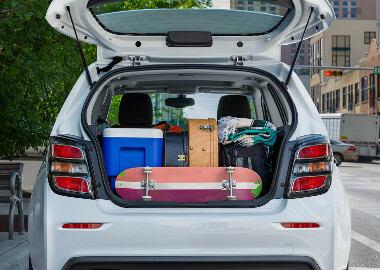 ft. of trunk space, Sonic Sedan boasts more room than the 2017 Toyota Corolla. Sonic and your compatible smartphone couldn’t be more in sync. But don’t worry about feeling like the third wheel — their BFF status is meant to help you stay connected on the go. The myChevrolet Mobile App puts the power of Chevrolet in the palm of your hand, letting you stay connected to your vehicle from virtually anywhere. If properly equipped, start/stop your engine and lock/unlock your doors, send destinations to your available navigation system, view diagnostic information, and even set parking reminders. As your comprehensive owner benefit program, Chevrolet Complete Care ensures our commitment to owner satisfaction for all 2018 Chevrolet vehicles.